2018: Budinger began playing on the AVP Tour with Sean Rosenthal. The duo played six times, with a best of second. Budinger ranked sixth on the Tour in kills (6.98 per set) and eighth in hitting percentage (.454). 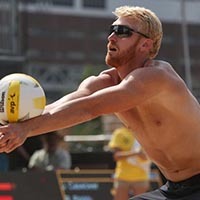 2011: Budinger competed in his first pro beach volleyball event in a domestic tour with Dane Jensen, finishing 33rd. College: Budinger was a three-year starter in basketball at Arizona, playing in the NCAA Tournament each year. Personal: Budinger was the 44th pick in 2009 NBA Draft with the Detroit Pistons and was then dealt on draft night to the Houston Rockets. Budinger played 407 games in the NBA over seven seasons from 2009 until 2016 with the Houston Rockets, Minnesota Timberwolves, Indiana Pacers, and Phoenix Suns. He competed in the 2012 NBA Slam Dunk Contest. Budinger has an older sister, Brittanie, who played volleyball at San Francisco, and an older brother, Duncan, who plays on the AVP. In high school Budinger was rated as the No. 4 basketball player in the country by Rivals.com while also being named the Mizuno National Player of the Year by Volleyball Magazine.